One third of B2B marketers say their demand generation budgets will grow by more than 20% in 2013, lead quality is getting increased scrutiny and social media as a B2B marketing tactic is on the rise. 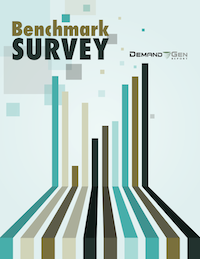 Those are just some of the results shared in this preview of the 2013 Demand Gen Report Benchmark Survey. The survey was designed to gauge marketers’ demand generation spending plans for 2013 and how those budgets compare to the overall marketing budgets. The survey also looked at how marketers will allocate their demand generation dollars in the coming year. The increased spend on demand generation parallels the rise in overall marketing budgets. While 32.6% expect their demand generation budgets to increase by more than 20%, 31.4% anticipated a 20% rise in their overall marketing budgets for 2013. About one third (30.2%) expect their demand generation budgets to rise by up to 10% in 2013 and 16.3% said they would remain unchanged, also closely mirroring expectations for overall marketing budgets. There was a steady rise in demand generation and overall marketing spend compared to 2012, when 38.4% reported that their demand budgets were 1% to 10% higher and 39.5% reported that their overall marketing spend was up by 1% to 10%. This is not surprising, as 86% noted that demand generation became a higher priority in 2012. An overwhelming majority reported that their demand generation budgets will either rise or remain the same, with only 2.3% reporting a decrease. Marketing campaigns, and demand generation efforts in particular, are expected to make a significant contribution to total revenue growth. When asked what percentage of annual revenue is attributable to marketing-sourced leads, approximately one forth said 24% to 50% of revenue was fueled by marketing-driven prospects. Nearly one fifth (19.8%) reported that marketing leads were responsible for 11% to 25% of revenue growth. When asked about the total amount of revenue growth their companies anticipated in 2013, 36% said they expected growth of 1% to 10%; while 31.4% expected revenue growth of more than 30% and 25.6% forecasted revenue growth of more than 30%. Marketing is also increasingly measured by its contributions to the sales pipeline and revenue. More than one third (33.7%) of respondents said their marketing organizationshave lead-based and revenue-based quotas in place, and another 15.1% plan to establish quotas in 2013. While lead volume is still important to marketers who need to keep the sales team stocked with prospects, and those prospects must be hot. The survey revealed that nearly half (46.5%) of marketers surveyed ranked focusing on lead quality over lead quantity as a top priority in 2013. Data accuracy was also high on the list of priorities, as more marketing organizations emphasize data integrity and properly crediting leads to marketing or sales. More than one third (33.7%) rated this a four out of five in terms of importance, while 20.9% rated it a five and 31.4% rated it a three, so database maintenance is clearly coming to the forefront as an issue. B2B marketers expect to turn to social media more frequently in 2013 as a demand generation tactic. While 9.3% of respondents rated it a five on a scale of one to five in terms of importance in 2012, 21.4% said social media will be of high importance (five) to their demand generation efforts in 2013. Custom landing pages are also gaining favor as demand generation tools: More than one third (34.5%) rated custom landing pages a five for 2013, up from 22.4% in 2012. Marketers are also warming up to video as a demand generation tool. While 16.5% rated video a five in terms of importance in 2012, that number rose to 22% in 2013. Online advertising, in the meantime, moved up to 16.7% of marketers rating it of highest importance in 2013, up from 9.4% in 2012. Standard lead generation tools such as white papers, email and webinars saw small increases in their predicted importance for 2013, while live events and telemarketing saw declines. Most marketers are using the wide variety of demand generation and lead tracking tools at their disposal. Web analytics ranked high among the current technologies in use (82.6%), followed by custom landing pages (74.4%), automated lead nurturing (65.1%) and lead scoring (64%). When asked about the technologies they plan to deploy in 2013,custom landing pages was at the top of the list, cited by 66% of respondents. Campaign management and web analytics were both mentioned by 61.6% of respondents. More than half of all respondents (57%) said that they would install social media tracking/monitoring tools in 2013 as social media outlets become more important to B2B marketing efforts. Lead scoring tools were on 55.8% of respondents’ planned deployment lists, followed by automated lead nurturing at 52.3%.